Clan-Gifts.com - Scottish Clan Names - Clan Cameron Store! The name is thought to be derived from the Gaelic "cam-shron" meaning "crooked nose" but the earliest records show the name as "Cambron" which may indicate that it originated in Camberone (from the Gaelic "cam brun" meaning "crooked hill" - now Cameron parish) in Fife. However, there is also a Cameron placename in the outskirts of Edinburgh and in Lennox. To add to the confusion, there is a Cambron in Flanders and the Cameron coat of arms differ only in colouring from those of the family of Oudenarde, nobles in Flanders. There is a record of a John Cameron in the Carse of Gowrie (on the other side of the river Tay from Fife) and Hugh Cambrun was sheriff of Forfar and John Cambron was sheriff of Perth. A hundred years later the name appeared in Lochaber in the far west. Often described as "fiercer than fierceness itself" the Camerons originally consisted of three branches in Lochaber - McMartins of Letterfinlay, McGillonies of Strone and McSorlies of Glen Nevis. The first chief of the combined families was Donald Dubh (born around 1400) who was descended from the McGillonies of Strone but through marriage with the McMartins brought the federation together. Donald Dubh and his successors were known as captains of Clan Cameron until the early 16th century when the lands of Lochiel were united by charter into the barony of Lochiel by Allan Cameron, the 12th chief. The clan assisted Donald, Lord of the Isles at the Battle of Harlaw in 1411. A chief of the clan, Ewen of Lochiel, was born in 1629 and was a supporter of King Charles II. He was knighted in 1682 and fought at the Battle of Killiecrankie in 1689. Oddly, there were Camerons fighting on the other side - Camerons from Fife who supported the Protestant cause. Ewen of Lochiel was too old to fight in the 1715 Jacobite Uprising but sent his son and the clan to assist the Earl of Mar. Sir Ewen's grandson was known as "the gentle Lochiel" and is regarded as one of the noblest of all the Highland chiefs. He was persuaded, through loyalty to the crown and the persuasive words of Prince Charles Edward Stewart, to support the 1745 Jacobite Uprising. It is said that if Cameron of Lochiel had not agreed to participate, the rising might never have got off the ground, such was his influence. During the Jacobite retreat, Lochiel prevented the Highlanders from sacking Glasgow and to this day when Cameron of Lochiel enters the city, the bells of the churches are rung in his honour. The Gentle Lochiel survived Culloden and was exiled to France. Following the General Act of Amnesty of 1784 the Cameron lands were restored and Gentle Lochiel's grandson, Donald, became the 22nd chief. In 1793 Allan Cameron maintained the fighting tradition of the clan by raising the 79th Regiment which, in 1881, became the Queen's Own Cameron Highlanders. The 25th chief, who died in 1905, was a Member of Parliament and his son raised four new battalions of the Cameron Highlanders on the outbreak of the First World War. Cameron was the 35th most frequent surname at the General Register Office in 1995. The motto of the Camerons is "Aonaibh ri chéile" ("Unite"). Septs (sub-branch) of the clan Cameron include Clark, Clarke, Clerk, Clarkson, Macolonie, MacChlery, MacGillonie, MacKail, MacLerie, MacMartin, MacSorley, Martin, Paul and Sorley. 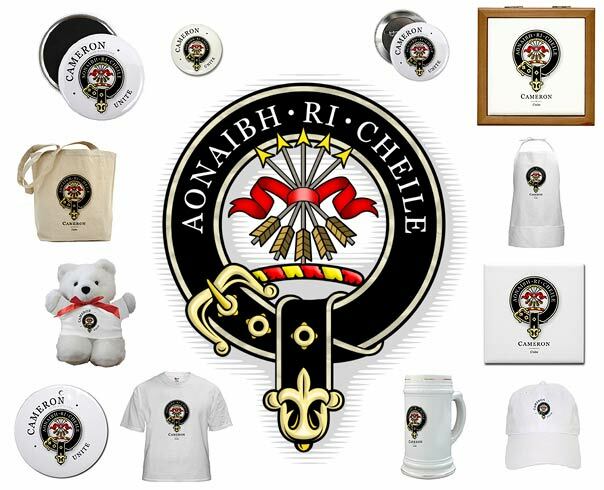 At Clan-Gifts.com we offer a wide range of quality Scottish gift Items, souvenirs, apparel and housewares, all printed with a beautiful rendition of your authentic Clan Cameron crest! Our Clan Cameron gift store stocks over 70 products*, and all items are fully guaranteed! Our great prices, low shipping costs and excellent customer support make us an excellent choice for Scottish Clan Cameron merchandise! surname we'll create a store for you and add it within 24-48 hours. We promise we won't send you spam, and your email address won't be sold to any third party! PLEASE HELP US MAINTAIN OUR WEBSITE! Click on a sponsored ad below!